We are also closed on Tuesdays in January and February and on March 25, 2019. We want your visit to be a great experience. Please see our Guide to Visiting section for answers to commonly asked questions. Admission to the Mark Twain House is by guided tour only. Our expert guides will show you the beautiful Stick Style home, which National Geographic named as “one of the 10 best historic homes in the world.” You’ll learn about life in the Clemens household between 1874 and 1891. Sam and Olivia Clemens built this unique 3-story, 25-room mansion to be near Sam’s publisher. Here they raised their three daughters with the able assistance of various servants including a butler, coachman, maid, cook, gardener, and others. Learn all about the family, friends, servants, and even the pets when you visit. Bring your curiosity and questions to our knowledgeable guides for a peek back in time to the Gilded Age, Mark Twain’s work, and his personal life. If you know your plans to visit a day or more ahead of time, you can purchase tickets online. Tours do sell out, so advance purchase is recommended. Online sales close several hours before each tour’s start time. Any remaining tickets are sold at the door, first-come, first-served. Members of The Mark Twain House & Museum receive free admission. Let’s GO Arts! cardholders are eligible for a $2 discount on regular tours of the Mark Twain House. (This discount does not apply to specialty tours such as Graveyard Shift, Get a CLUE, and Living History tours.) Present your card at the ticket desk to get your discount. Discounts are available to those who wish to tour both The Mark Twain House and the Harriet Beecher Stowe Center. Imagine being led through Mark Twain’s historic home by a faithful servant, a gossipy maid, or even Mark Twain’s wife! Visitors will be taken back in time on our new Living History tours, led by historic characters in period dress. These tours run approximately one hour and fifteen minutes and allow visitors special access and privileges, including a trip to the basement and photo opportunities with the character. The stories told on each Living History tour are unique to each character, so we invite you to visit – and visit again! – for a whole new experience each time. Ghostly tales and stories of spirits surround the Mark Twain House. Learn about the Victorians’ fascination with spiritualism – and find out why SyFy Channel’s popular paranormal series Ghost Hunters brought its investigative team to the house! Ghost tours are offered seasonally. Click here for upcoming dates and tickets. These tours are available by reservation only. Who killed that varmint Pap Finn? 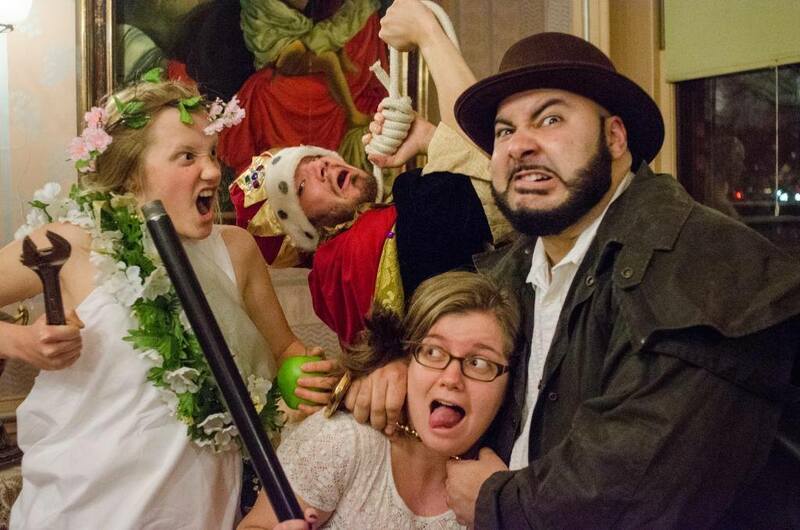 Play our live-action version of the classic game CLUE in the Mark Twain House. Was it Becky Thatcher with the revolver in the Conservatory? The Prince (or was it the Pauper?) with the knife in the Library? This hour-long tour features actors from SEA TEA IMPROV playing Twain’s beloved characters/suspects and all the murder, mayhem, and merriment one would expect from Sam Clemens! These tours were featured on the Travel Channel show Wackiest Tours! Click here for schedule and tickets. From late November through January 1 every year Twain’s mansion is adorned as it was for holiday celebrations from 1874 to 1891, when the author, his wife, and their three daughters lived in the house. The Mark Twain House tour is adapted to share many stories and details of how the Clemens Family celebrated the Holidays. All of our public tours during this period will included holiday material.